Creating a strong green economy which is resilient to climate change is at the heart of Defra’s contribution to economic recovery, Environment Secretary Caroline Spelman announced today. Mrs Spelman was joined by the Prime Minister, David Cameron, to publish the Environment, Food, and Rural Affairs Structural Reform Plan, which sets out how Defra plans to ensure that economic growth, protecting the environment, and enhancing the competitiveness of the whole food chain are inextricably linked. Defra’s Structural Reform Plan (SRP) lays down three departmental priorities to support and develop British farming and encourage sustainable food production; help to enhance the environment and biodiversity to improve quality of life; and support a strong and sustainable green economy, which is resilient to climate change. “The coalition government has pledged to be the greenest government ever. That means making sure we have the greenest economy ever. “Businesses, communities, and individuals need to be supported to innovate and invest, use resources sustainably, and reduce waste, so that the economy is resilient to climate change. “The food and farming industry, from the farm to the plate, has demonstrated its ability to withstand economic shocks and will be a pillar of the new green economy, so it is vital that we do what we can to enhance its competitiveness. Structural Reform Plans set clear priorities and measurable milestones for every department, allowing people to check on how departments are meeting their commitments. publishing a White Paper on reform of the water industry to ensure more efficient use of water and protect poorer households. 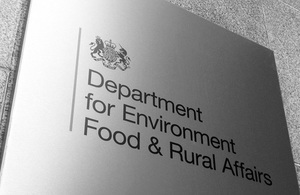 Defra’s Structural Reform Plan has been published on the Defra website in commentable format, to allow public discussion of the department’s priorities. Further details can be found at: http://www.defra.gov.uk/corporate/about/what/business-planning/. The SRP will be updated as further details of its implementation become available. 1. Implementation of the Structural Reform Plan is subject to the conclusions of the Comprehensive Spending Review, set to be completed in October 2010. 2. Defra’s full business plan will be published in the autumn, following the publication of the government-wide spending review.